The classical music world is changing. And USC Thornton is changing with it. In our continuing commitment to a virtuosic education for musicians, the school recently unveiled a new educational model for classical music, rolling out for undergraduate students in the Fall of 2019. 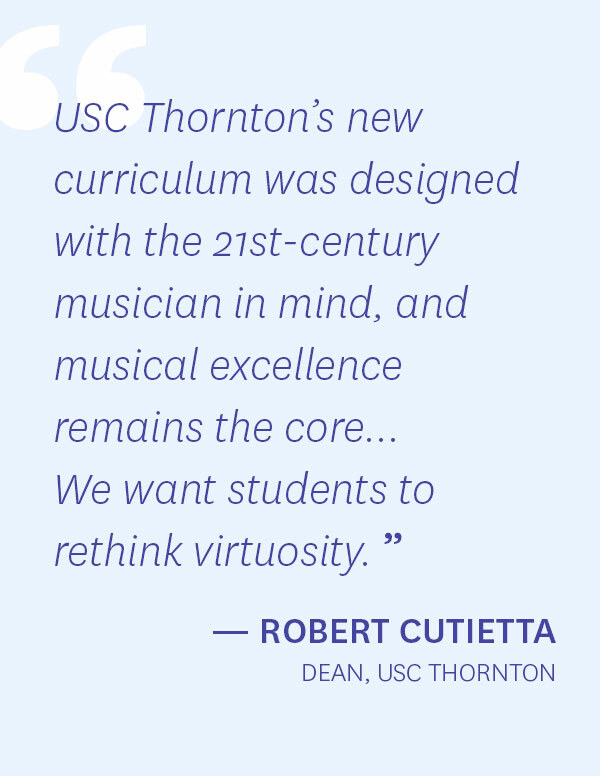 USC Thornton is located near downtown Los Angeles, a hotbed of this creative renaissance, where professional organizations and Thornton students alike are expanding the idea of what a performance, a composition or a career in classical music can be. The school is poised to lead the change in expanding the idea of the new virtuoso. The structure of the degree will have flexibility and choice so students will chart their own musical path and take electives in any area that could help them further their artistic vision, while maintaining the classical core. Students will still invest considerable amounts of time practicing, honing their musical craft. Because career development is integrated into the four-year curriculum, students will work toward their professional goals from day one. Whether competing for coveted orchestral positions or launching their own ensembles, they will not only have a wider range of opportunities, but will be able to create their own. Just as boundaries are quickly disappearing across the entire music profession, the new curriculum will encourage a cross-genre approach to music training. At the heart of the new program is the Young Artist Project. In the junior year, students begin to work on a Young Artist Project, which provides the opportunity to specialize, collaborate, and design a project that reflects their distinct musical voice and artistic interests. Students might visualize a composition, develop a hybrid performance, conduct research, or even explore new creative technologies – the Young Artist Project is about developing a unique voice to make their art powerful and relevant today.